Are you tired of lemon yet? No? Good. 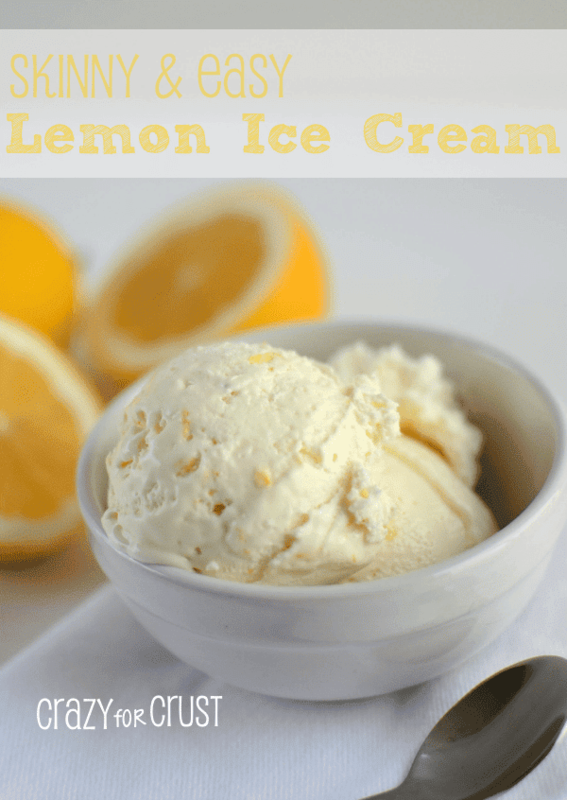 Because I have two more lemon recipes for you. The first one? 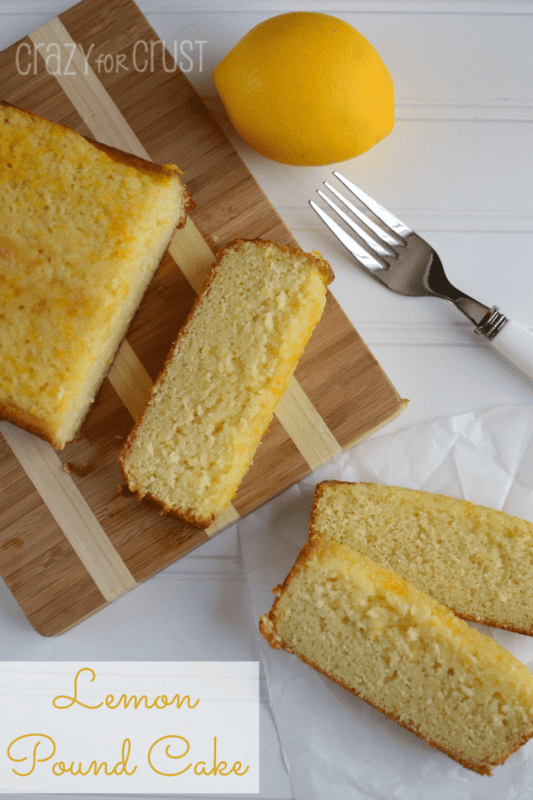 This Lemon Pound Cake. I’m going to go out on a limb and call this cake magical. Pure, delightful magic. Unicorns flew around my kitchen. There was a wizard sitting on my oven, a fairy in my hair, a mermaid swimming in my sink, and I think I even saw Harry Potter sneaking around my dining room. 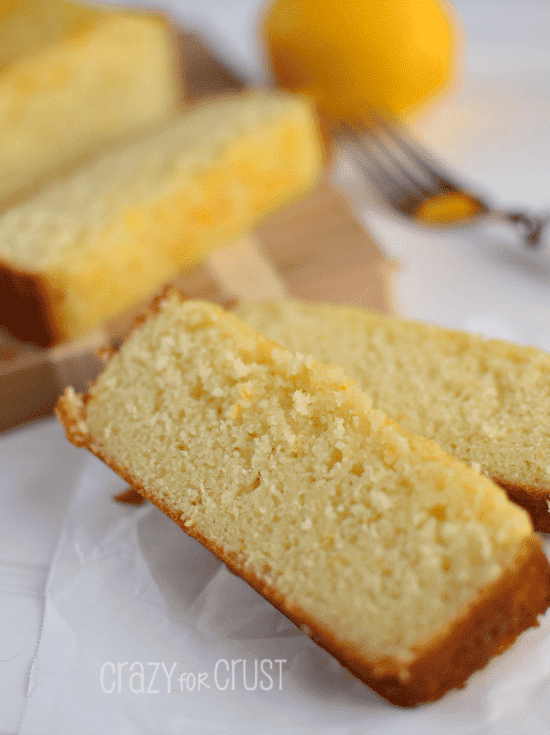 Even if you think you don’t like lemon; if you swear up and down that lemon desserts are not your thing (ahem, MOM), you would like this pound cake. Really, magic. Like the tooth fairy and the Easter Bunny. Only better. I was worried about making something so…normal. I mean, you know me. When I make lemon desserts, I make them into cookies or fudge. I add cookies into blondies and Red Hots into Chex. I don’t do “normal” very often. 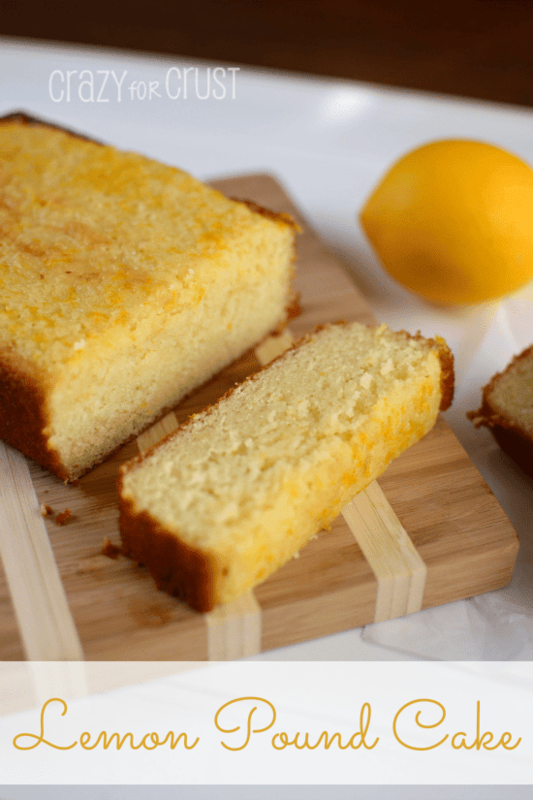 But a friend asked me if I had a lemon pound cake recipe. She was having a monster lemon pound cake craving. I still had a bag of lemons in my fridge…so how could I say no? Challenge accepted. The cake part is a Martha Stewart recipe. I mean, Martha is rarely wrong, right? The cake is light and fluffy, while also dense. And it’s perfectly lemony thanks to the addition of lemon juice and lemon zest. I used Meyer Lemons in this, because that is what I had. This would be just as good with regular lemons too! When the cake comes out of the oven, you cool it slightly and then remove it from the pan. And that’s when you add the magic to it. In this instance, the magic wand is in the form of a lemon glaze, made of sugar and water and lemon. You boil it down, simple-syrup style and pour it over the warm cake. Then you make a lemon drizzle out of powdered sugar and lemon juice and pour that over the top of the cake once it’s cooled. It’s the Lemon Trilogy. Pure magic! And you know the most magical part? This recipe makes TWO pound cakes. One to give…and one to eat all by myself in front of The Real Housewives of Beverly Hills. See? Magic, I tell you. Unicorns, lemon, and all. In a liquid measuring cup, combine milk with lemon zest and juice. Whisk together flour, salt, baking powder, and baking soda in a medium bowl. With an electric mixer, cream butter and sugar until light and fluffy. Add eggs, one at a time, beating well after each addition. Add the flour mixture (with the mixer on low) in three parts alternately with the milk mixture, beginning and ending with flour. Beat just until it comes together. Do not overmix! Divide batter evenly between pans; smooth tops. Bake until a toothpick inserted in centers comes out clean, 50-60 minutes with the smaller pans, 40-50 minutes with the larger pans. You can tent with foil if they brown too quickly. 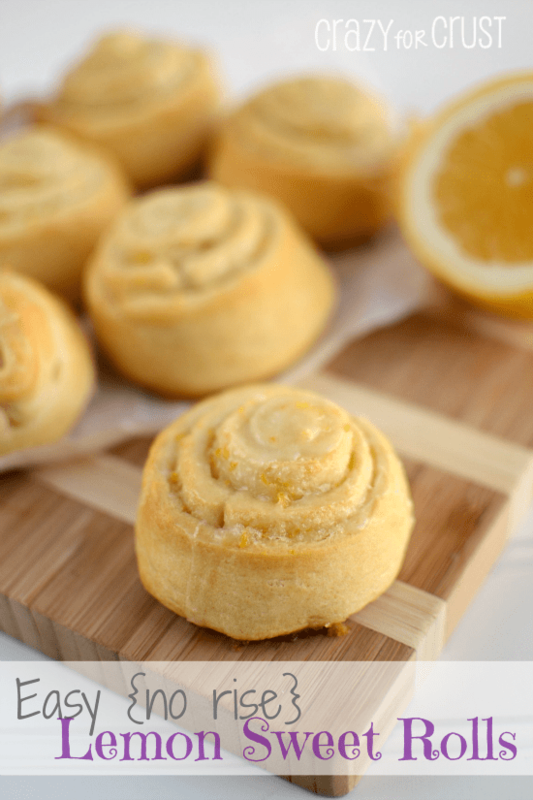 While the cakes are baking, make the glaze by heating granulated sugar and lemon juice in a small pan over low heat. Bring to a simmer and stir. Once sugar is dissolved, remove from heat and let sit until cakes are done. Once done, cool cakes 15 minutes in pan. Turn out cakes onto a rack. Use a pastry brush to spread the glaze evenly over the tops and sides of both cakes. Let dry and completely cool, at least 2 hours. Make the drizzle by mixing all ingredients with a whisk. Set rack with cakes over a baking sheet lined with waxed paper. Pour drizzle over cooled cakes, letting it run down the sides; let dry, about 30 minutes. Oh goodness, I’m drooling on my screen! This looks so delicious! Lots of love for this cake. I made two loaves last night and broke into one this morning. Had some lovely slices with my coffee. I thought it would be made even more delectable with a blueberry topping. Simple syrup, add the berries, cool and then top slices as they’re served for dessert. Quick note: The batter calls for vanilla (1 tsp), but it’s not included in the directions. Assume it’s supposed to be with the creaming of sugar and butter. You may want to edit for future bakers. Thank you for letting me know Amy! And for sure, the blueberry would be amazing! I just made this in cupcake form and they turned out really well! Thanks for the recipe! Awesome! That’s great to know Anna. Thanks! wow this cake looks amazing. The texture of this cake looks good… Thanks for share! how do you eat so much sugar and stay thin??? Thin is an operative word. I taste everything on the blog but I don’t eat entire cakes (most of the time, ha!) But I work out 6 days a week, including running and strength training. The texture looks good, and the taste so delicious.